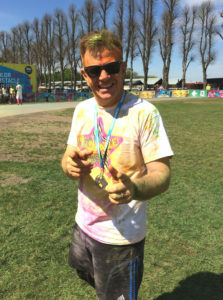 Founder and joint owner of Forays Homes, Arran Atkinson took part in the Color Obstacle Rush 5k, the ultimate fun run, held on Sunday 8th May at Windsor Racecourse. The Color Obstacle Rush is a unique event combining the fun of coloured powder and the excitement of an obstacle course. Founded in Finland in 2014, under the Finnish name ‘Variestejuoksu’, the fun run has grown increasingly popular in the last two years. The course consists of 20 brand new obstacles including 8 inflatables colouring stations. Each obstacle is designed with fun in mind and involves ample amounts of sliding, bouncing, tumbling and tangling. You can find yourself in the middle of rapid-fire sponge balls, or competing in a hopper race, this course really does have something for everyone. Arran raised money for Phyllis Tuckwell, the Hospice Care service for adult patients and their families across West Surrey and part of North East Hampshire. To find out how you can help and raise money for Phyllis Tuckwell, take a look at their website. If you would like to take part in the next Color Obstacle Rush 5k be sure to check out their website for more information.